PRICES: Check out Rates and Reservations page for our base rates plus the prices for our various packages. PACKAGES: We have a number of different Yoga Retreat packages. Try the Yoga & Adventure, Yoga & Rejuvenation, Yoga & Surfing, or the Pure Yoga package. For more information please read more about our Anamaya Retreat Packages. Or for those who are not totally into yoga, there’s no need to choose a yoga package at all – you can book all your activities and excursions A La Carte. We call it the Relaxation Retreat. WORKSHOPS: We are excited to have two Guest Yoga Teachers this week at Anamaya, and both teachers will be offering some very special Workshops to our guests. These include Workshops on Ayurveda, Vedic Astrology, Arm balances, and Inversions. Please have a look below for more information. Natasja Payne, a Dutch native, lives and operates a busy yoga studio in Cambridge, Ontario, Canada. Natasja’s background is in dance, and attended the renowned modern dance school, CodArts in Rotterdam, The Netherlands and enjoyed many years of an active dance career. 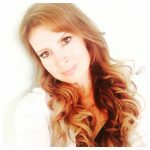 After the birth of her first child in 1998 she began her career in fitness and taught group exercise classes, group trainings and one-on-one trainings for GoodLife Fitness where in 2007 she was awarded “Fitness Instructor of the Year” for Canada. In 2008 when her mother-in-law was diagnosed with cancer, Natasja felt the pull and need to expand her own yoga practice and to create a sacred space where like minded individuals could gather and enjoy the practice of yoga in a serene, calm and spiritual environment. Today she operates Fusionmovement Yoga Studio, boasting two spacious practice rooms, 14 yoga teachers, and over 45 drop-in classes a week. Natasja is an active teacher at the studio as well as in her community. She often is invited to teach at local high schools, elementary schools, businesses and community events. Natasja has been teaching yoga for over 15 years, has led International yoga retreats in Costa Rica, as well been a presenter at the International Toronto Yoga Conference and at the World Fitness Expo in Toronto. She is well known for her creative, fluid, and dynamic yoga classes where she interweaves pearls of wisdom to create that “magic” in her classes. She is currently studying to become and Ayurvedic health consultant practitioner with the school of Kripalu, and is very excited to share this ancient art of healing that can bring one back into ultimate balance and vibrant health. Natasja is grateful for her teachers; Seane Corne, Coral Brown, Rod Stryker, Maria Garre and Shiva Rea. 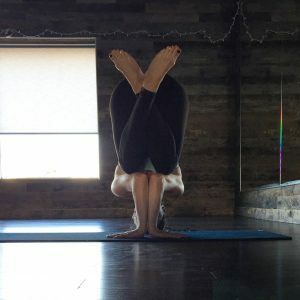 She is excited to be able to share her passion, love and joy of the yoga practice with you in hopes that it may bring transformation, healing and intrinsic joy. Natasja believes that yoga is for everyone and for everybody! Her classes are inclusive and she has the amazing ability to teach the same class at multiple levels, therefor every person in her classes feel safe, successful, and balanced in body, mind and spirit. The morning vinyasa yoga classes begin with a grounding movement meditation and breathing (pranayama) practices, allowing the student to fully drop-in and be present on the mat. Each class will have a different theme and/or peak pose. Classes are sequenced with great creative intelligence, so that the body and mind are completely prepared to move into the peak pose. Hands-on-enhancements are provided throughout the class allowing the student to experience a deeper embodiment of the pose. Each class ends with a 10 minute shavasana and/or meditation. Natasja’s unique touch is that she leaves you an oracle card at the top of your mat with a message that is just for you. The late afternoon yoga classes are very gentle and restorative in nature. Essential oils and therapeutic touch are used, creating a magical and nourishing experience for the student. These classes incorporate breathing (pranayama) practices, mudras (sacred hand gestures), and/or myofascial release techniques. Sandi found her way into her first yoga class 20 years ago, around the time she began her career as a Holistic Nutritionist. She was an avid gym-goer, so yoga seemed like the perfect complement to her fitness regimen. Over the next few years, however, as life became more hectic and stressful with a young growing family, physical injuries, and anxiety, Sandi realized she needed to focus on a form of movement that integrated all parts of her being. Yoga didn’t just strengthen and stretch her body, it fed her soul! Life’s struggles offer the gift of transformation. During this period of transition, Sandi’s fate was sealed with a deep desire to share her love of yoga with others. She considers it a sincere and humble privilege to guide students through their practice and feels truly fortunate to be part of their journey. She strives to lead with an open heart, creating a safe, sacred space for her students to practice. Sandi received her formal yoga training with Susie Dias at East to West in Toronto, and with her mentors, Natasja Payne and Kate O’Connor at Fusionmovement Studio in Cambridge, where she has practiced since 2009. 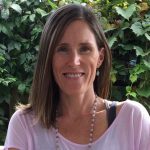 Sandi’s personal passion lies in the challenging, transformative practice of Power Flow Yoga, but she also loves teaching many styles of yoga including Gentle, Restorative and Yin. Finding balance can be difficult in our lives today. As a Yoga Teacher, Nutritionist, and mother of 4 beautiful, busy daughters, Sandi’s life is full of paradox. It’s amazing, stressful, organized, messy, calm, chaotic, and sometimes quite un-Zenlike. It’s not perfect, but it’s real. She feels that yoga can bridge the gap between the reality of our busy lives, and the peace and happiness that we all seek. Sandi teaches in a very down-to-earth style, because that’s who she is. Her approach is more grounded, less airy-fairy. When you roll your mat out in her class, you feel welcomed and comfortable whether you are a seasoned yogi or a beginner. She teaches safe alignment and intelligent sequencing throughout her powerful Vinyasa classes, encouraging each student to honour themselves and find their own edge. Sandi has experienced firsthand the power of yoga and has witnessed that it’s at this edge where transformation occurs. She believes the true purpose of even the most challenging asana is to practice mindfulness – to focus on the breath, to be truly present, to create space in the body and the mind. How to optimize your own health & well-being, Ayurveda is the oldest healing modality in the world and is the sister science of yoga. In recent years, more and more physicians are taking notice as the science of Ayurveda is able to give one a deeper understanding of where disease originates in the body. Many doctors are beginning to realize that the “bandaid” solution is no longer working for their patients, they are tired of giving patients medications to curb the side effects of the medication they prescribed to treat their condition in the first place. Ayurveda is a system that understands that the mind and the body are inextricably connected, nothing is more powerful than the mind. The mind has the ability to transform and heal the body. In this workshops we will look at the mind and how they are influenced by the three Gunas of Satva, Rajas and Tamas. You will be given tools to optimize Satva in your life, you will also learn what your constitution (dosha) is and what it is you can do to optimize your constitution by making small changes to your diet and lifestyle. The workshop will be concluded with a meditation that balances all constitutions of Vata, Pitta and Kapha. In this workshop you will learn the basic concepts of a Vedic Astrology chart, the blueprint of your soul. Your chart is a unique blue print of who you are and the gifts you were born with. At the time of your birth the planets were positioned in specific houses, signs and nakshatras. Every second and minute small changes occur in the placements of these planets, therefor there is only ONE you and no birth chart is ever duplicated. In this workshop you will gain a deeper understanding of each astrological sign, the 12 houses and what they signify, the 7 planets and the nakshatras of the moon. Please bring your time of birth, date of birth, and place of birth. Each student will have the opportunity to receive a unique astrological personal reading. This workshop is limited to 10 students to allow for the personal readings. Arm balances and inversions are not just about physical strength, though they do help build strength and endurance like nothing else! They also teach us how to integrate the body, the mind and the breath by challenging ourselves at the edge of our comfort zone. Each time we bump up against those edges, we build new layers of strength, focus and determination that perhaps we didn’t even realize we had within us. Resiliency: to get back up, when we inevitably fall in life! With patience, perseverance, and a dash of faith in oneself, poses that seemed impossible at first glance, suddenly seem possible. This is the power of yoga! In this workshop, Sandi will teach you the fundamentals and guide you step-by-step through the prep poses necessary for building a solid foundation. We will explore the foundational arm balance Bakasana (crow pose), as well as Parsva Bakasana (side crow) and Astavakrasana (eight-angle pose). Learn the 4 key components necessary to rock your arm balances! Whether you are new to arm balances and want to overcome fears, or are a seasoned yogi looking to deepen your practice, there is something for every level in this 2-hour workshop. Part 2 – Inversions: Flip your Perspective! Building upon the skills learned in the Arm Balance workshop, you’ll flip your perspective in this inversions workshop! We will focus and identify the 3 components of a safe, strong inversion practice. Sandi will guide you into inversions with proper alignment, teaching you the fundamentals of Sirsasana (headstand), Pincha Mayurasana (forearm balance) and handstand in this 2-hour workshop. Whether you are looking to overcome your fear of inversions, or you want deepen your practice by refining your headstand or learning new transitions, this workshop will allow you to see your world from a brand new perspective! Although you will benefit most from these workshops if taken in sequence together, they have been designed to be taken individually as well. All levels welcome.